Earlier this week I mentioned wanting to find a recipe using Mexican chocolate, and now I have. This is a great recipe for Mexican Chocolate Chunk Cookies. It’s not just a basic chocolate chip or chunk cookie with cinnamon in it, but instead it uses real Mexican drinking chocolate. 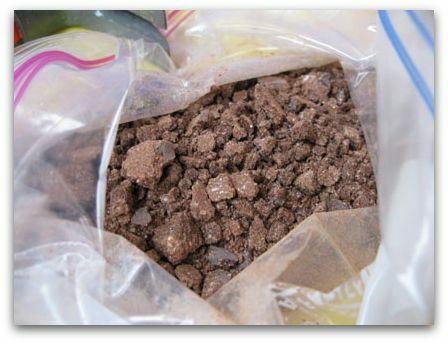 …that is, real Mexican chocolate – the very sweet, hard, cinnamon flavored type commonly used for hot chocolate. It’s definitely not the type of chocolate you’d swap out for semi-sweet unless you find the perfect recipe. This was it! Thanks KAnn, for giving me the link to Mexican Chocolate Chip Cookies, which was the springboard to this cookie. I would have been content to make the Epicurious version of the cookies, but reviewers weren’t completely happy with it. Rather than just complain, they made small changes and like a game of telephone, the recipe thread resulted in a very different and very good cookie. One thing to note is that the original recipe does not call for Mexican chocolate, so if you aren’t lucky enough to have access to real Mexican chocolate, you can still make a good cookie with the original recipe. You might want to increase the salt, though. 1/4 teaspoon didnt’ seem like enough. Sift together flour, baking powder, baking soda, ground cinnamon, salt and pepper. Beat butter and brown sugar with an electric mixer until fluffy. Beat in eggs 1 at a time, then vanilla. Add flour mixture and stir until absorbed, then mix in chocolate chunks and chopped Mexican chocolate. Refrigerate dough for at least one hour. Drop dough by rounded tablespoonfuls onto sheets, spacing 1 1/2 inches apart. Bake cookies until golden brown and set – 10-12 minutes. Let stand on sheets 3 minutes. Transfer cookies to racks and cool. **I usually count flour as 4.5 oz per cup, but I used a slightly heavier hand when measuring. If you never weigh flour, proceed as usual. If you use weights and not volume, go with the 9.5 oz weight or the 270 grams. Me again – And although I leveled my scoops of cookie dough (which is probably why I got more cookies than you did), the cookies are a good size. My friends at work are going to LOVE these! I just made these today and they are delicious!!! The only thing I did differently was to use 2 discs of Ibarra chocolate and 6 oz. of Trader Joe’s 72% dark chocolate. Since the Mexican chocolate comes in 3.1 oz. discs, I didn’t want to be left with a partial disc. Of course I could always use it up in some hot chocolate! I also used my 1T. ice cream/cookie scoop and I got 58 cookies. But hey – the more, the merrier! Thanks for the recipe – very tasty! Just made these again, and they were even better than last time. I did something weird before but don’t recall what. I did have to improvise a bit. I ran out of light brown sugar so used dark. I was also out of good dark chocolate (tragic! ), so I used Whole Food brand dark chocolate chunks, which are fine but not as good as a real quality dark chocolate bar. Slightly short of those so added a handful of semi-sweet as well, then threw in a handful of cinnamon chips. I also finally bought Mexican vanilla, so I got to use that. Scrumptious! A big hit at the Mexican-themed potluck I took them to. And still plenty at home for my husband and me to enjoy. Thanks for this one, Anna! Great! I’d go with cayenne because it’s hotter. If black pepper is all you have, then that would work too. I plan on making these soon. Do you recommend using cayenne or black pepper? How would it differ? Thanks for the report, and nice to know the cinnamon chips worked out. What a good idea you had to use those. I just made these cookies and they are good! I added Hershey’s cinnamon chips and used Ghiradelli 60% cacao chips. The cayenne gives just the right amount of tingling! Thanks for the recipe! Ok I made these and they really are great. I did notice that they had a sort of gritty taste, but my husband thinks that is from the cinnamon. I did make one small change as I was too lazy to go to the store and get more Light brown sugar. I used the dark I had instead and my cookies look really dirty..haha. They still taste great and I will add to my regular cookie rotation. Thanks for showcasing this recipe! my teeth are aching to bite into one of these. Thanks, Anna. I will check out the HEB around the corner. If not, I can always go to Fiesta when I make a trip to the Downtown WHole Foods for work stuff. The color IS just beautiful! I just want to reiterate how good these are! I can’t wait to hear opinions from others. The Ibarra chocolate really makes a difference because along with the extra cinnamon flavor, it adds a little crunch. Katrina, I’m not a huge fan of chocolate/cinnamon either, however, I do like it when other spices (pepper) are incorporated. I’m not sure why that is, but the sum of all the parts worked really well together. Daisy, check the aisle with the hot cocoa. H.E.B. usually has a couple of different brands. Let me know if you can’t find it. Fiesta has it too, but you should have to go all the way to Fiesta for it. Zanne, I’m a coffee drinker rather than a hot chocolate drinker, but I might try making some of the hot chocolate for my daughter. It will be interesting to see if she goes for the chocolate/cinnamon flavor. Let me know what you think of the cookies. A – I hate to say it, but my favorite thing to do with Mexican chocolate is to make hot chocolate with it!! I make it in the a.m. in place of coffee in the winter. That particular brand makes the best, richest cup of hot chocolate I have ever had. I heat the milk in the microwave, drop the chocolate in and let melt for a couple of minutes, use the molinillo to froth, and then drink. So good, and does just as good a job of waking me up as coffee!! 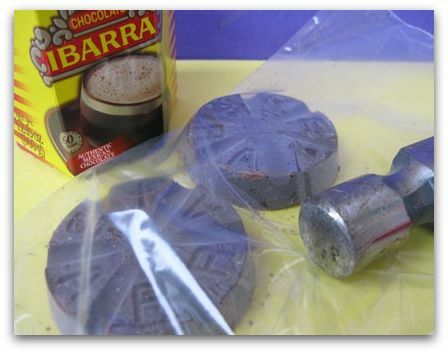 Your cookies look super tasty and I am going to try this, since I happen to have the Ibarra on hand! 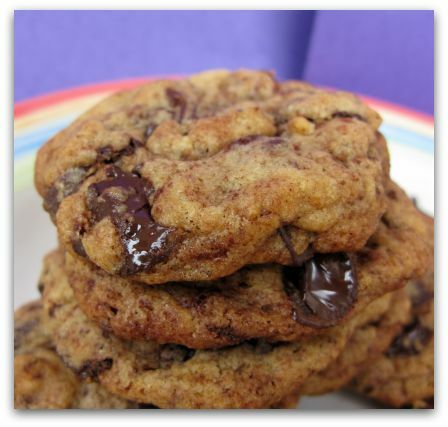 BTW, I tried that Guittard Extra Semi Sweet chocolate chips last week in Alton Brown’s “THe Thin” cookie – delicious! I wouldn’t have tried the chips had I not seen them here..thanks! These look really good, especially since the sweet Mexican chocolate is balanced by semi sweet chocolate. I love breaking up chocolate bars for my cookies rather than using chips — that way I can choose my favorite dark chocolate to use. One of my favorites is combination of, surprisingly, Perugins Bittersweet and Perugina Semi Sweet bars. These bars are super creamy. Generally I’m not a fan of chocolate and cinnamon together but this recipe might be an exception. Oooh, they look good. But I don’t know why, I’m never that fond of chocolate and cinnamon together (I know Rita, I’m weird!) I’ll have to give it another try sometime. 🙁 Things don’t look too good in Galveston, I’ve got the weather channel on. Oh, I am so thrilled, Anna! And so pleased the result was so fabulous…they look just wonderful!